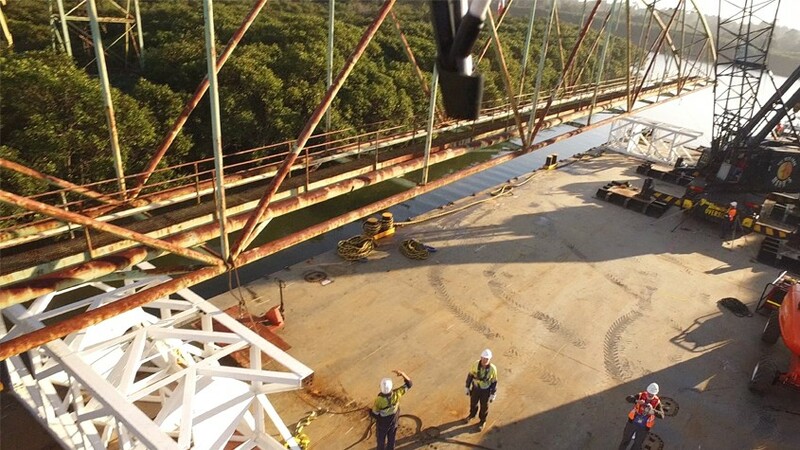 The project involved the removal of a redundant 70m single span pipe bridge at the former Clyde Refinery. The bridge had been out of service for some years and required removal due to extensive corrosion and some missing steel members. 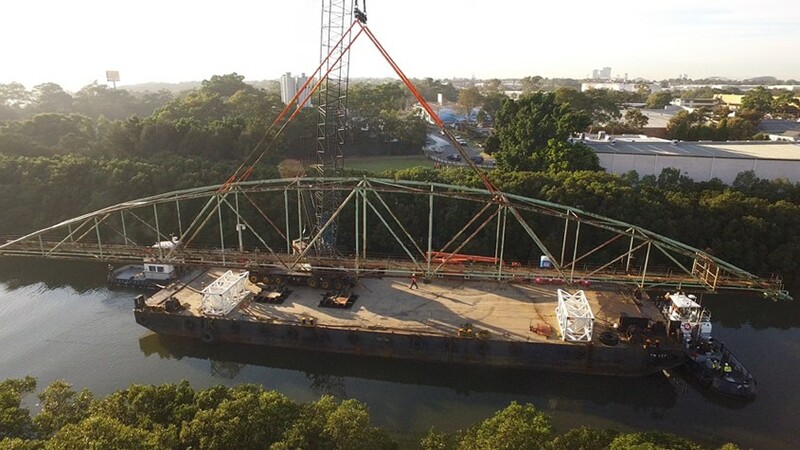 The bridge was lifted onto a barge, floated down Duck River and landed at the refinery wharf using a combination of mobile cranes. The preliminary stages of the project involved supporting the client in liaising with a number of government regulatory authorities. Whilst the bridge itself was under the jurisdiction of Roads and Maritime Services, the bridge support structures were located above the high tide mark, meaning approval for works in this area fell to Parramatta City Council on the western side and Auburn City Council on the eastern side of the river. 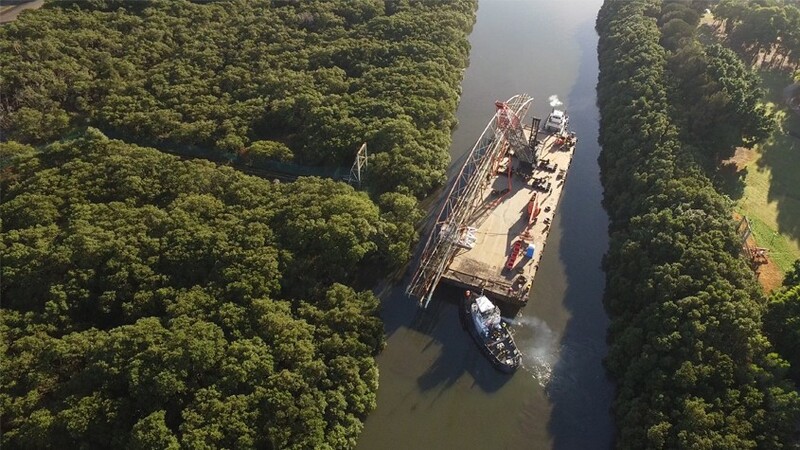 There was a significant level of scrutiny placed on the works given the environmentally sensitive location – the Duck River is lined with mangroves, which in New South Wales are protected by legislation. The proposed demolition activities within this zone were referred to the NSW government authority, Roads and Maritime Services for review. 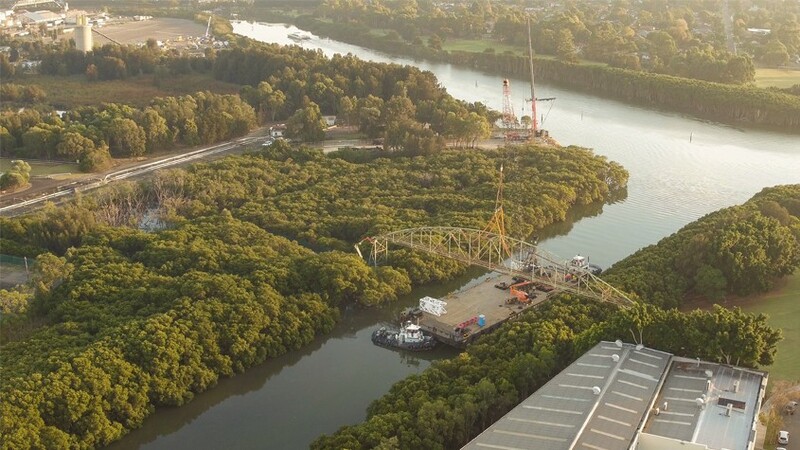 Approval was granted for the bridge removal on the condition that the mangroves on either side of the river were not removed or damaged under any circumstances. Initially, the bridge had to be structurally assessed and measurements are taken to establish its strength and integrity. In order to gain safe access for the structural engineers from GHD, a specialist rope access team were engaged. They devised an elaborate system of ropes and harnesses to facilitate safe access throughout the full length of the bridge. GHD carried out both a visual and Non-destructive testing regime to develop a better understanding of the bridge and its strength. This information was critical in determining the removal methodology. A dismantling approach was deemed to be the safest and most practical way forward. After a rigorous subcontractor review and selection procedure, specialist contractors Polaris Marine and Marr Contracting were selected as partners for the project. Following a number of design meetings and several draft proposals, the final methodology and sequence were agreed upon by the team. The proposal was then presented to the client to provide assurance that hydrocarbon assets in the immediate proximity of the bridge and wharf were not impacted in any way. Liberty Industrial was also required to satisfy the client’s specialist Marine team that safety risks associated with the barge/crane methodology had been appropriately identified and mitigated. To substantiate the work sequence the team carried upfront designs, plans and calculations. 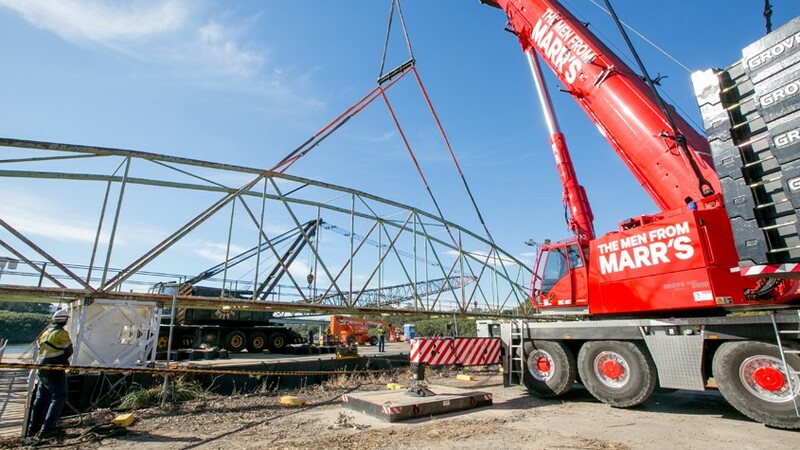 The heavy lift crane specialists submitted lifting plans for the main elements of the project, these were then scrutinised by the Liberty Industrial team and signed off by the structural engineers at GHD. To determine the stability of the barge during the various lifting elements, a Naval Architect was employed to calculate the extent to which the barge may list, and the requirement for any blasting during the works. In the days leading up to mobilisation Liberty Industrial’s project team accessed the sides of the bridge to gas test, confirming the pipework was free from potential hydrocarbon residue and the presence of explosive gases. This process enabled the issue of a hot works permit and allowed the pipes to be cut safely using an Oxygen/LPG torch. Whilst preparing the bridge for the pending lift the retaining bolts were cut out and replaced with new ones for ease of removal on the day. Once the detailed planning was complete, the critical path to the project was established as being the high tide on the river. Access up Parramatta River and Duck River with the barge and the two tugs were critical, with the draft on the tugs this could only be achieved within a two hour window either side of high tide. A review of the tide times and levels resulted in an optimum 3 day window; the 4th, 5th and 6th of May being the only dates in which the water levels and high tide time coincided to allow safe access up Duck River. The barge and the cranes were prepared the day before the scheduled lift. 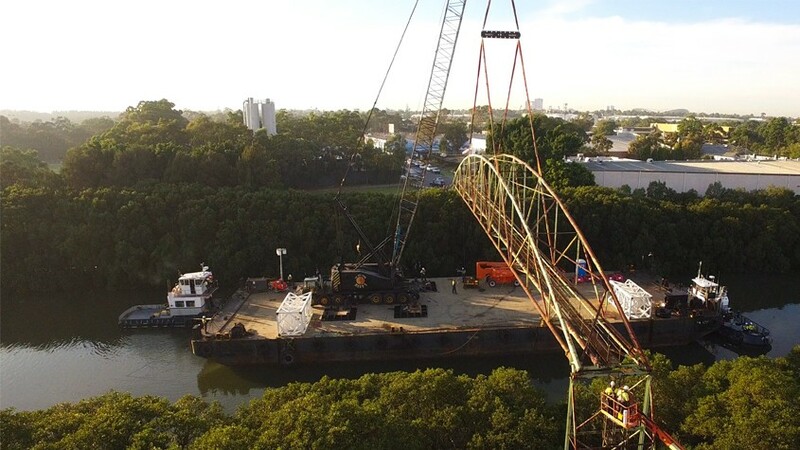 A 450 tonne Grove mobile crane was initially mobilised to the wharf. This was used to lift all the equipment onto the barge, including setting up the 270 tonne pin jib crane that was to be used for the primary lift. The Naval Architect assisted the crew with marking out and positioning the crane in the exact spot required. This was critical to the stability of the barge during the works. The detailed Work Method Statement compiled by Liberty Industrial’s project team segregated elements of the works into key areas of responsibilities. Hold and release points becoming the mechanism used to sign off and sign on to areas of responsibility as the works progressed. At 2.30am on the 5th of May 2016 the project team carried out the prestart meeting on the wharf at the refinery and then disembarked, making their way up the river towards the bridge. They positioned, anchored, and set up ready to rig the bridge. 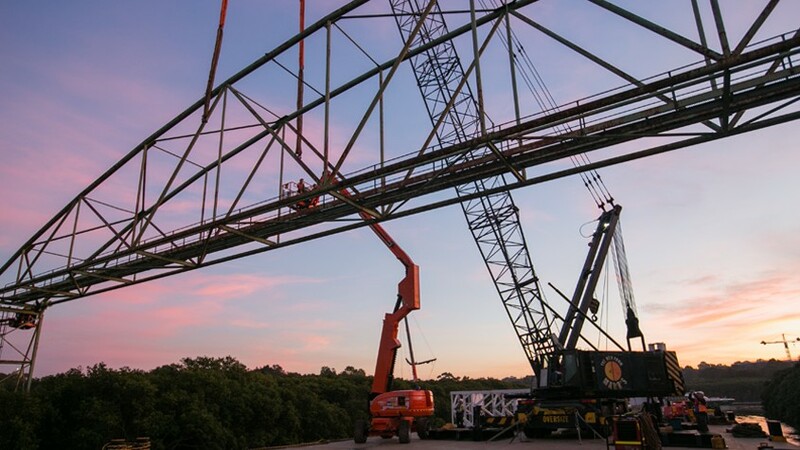 Perfect weather conditions and a spectacular sunrise allowed the structure to be rigged within the hour. A representative from GHD was on hand to check and sign off on the lifting points and the configuration of the slings. The bridge was then released at either end and the lift commenced, seamlessly being controlled at every critical point by Liberty Industrial’s Supervisor who orchestrated all parties throughout. The bridge was gently landed onto the barge deck without a hitch, lashed down in readiness for manoeuvring back to the wharf. The timing could not have gone better, with an hour to go the tugs raised the four anchors on the barge and commenced the journey back down the river to the refinery wharf. After waiting for ferries to pass on a couple of occasions, the oversize load was slowly and carefully berthed at the wharf, the crew carefully navigating the client’s adjacent infrastructure. All that remained was for the Grove 450 tonne crane to secure onto the original rigging and lift the bridge off the barge and on to the wharf. This was completed with ease, landing the 70 metre load for processing by a 36 tonne excavator with a third member shear attachment which made short work of the 50 tonnes of tubular structural steel, cutting it into manageable sections and then loading it into the waiting transport for removal. 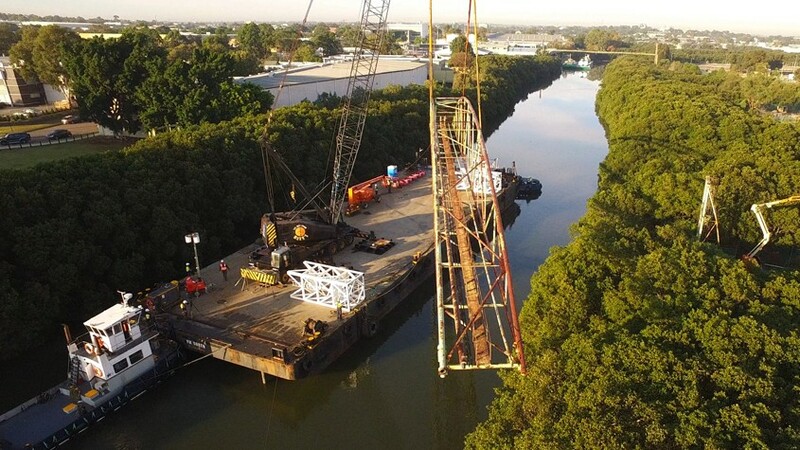 The demobilisation of the barge was completed by the end of the following day and the work area handed back to the client free from hazard within the allotted time frame. The project was awarded the Contract of the Year Under US$1M Award at the 2016 World Demolition Awards.